The Gods were afraid from the terror of this wild, destructive water-buffalo bull because most of them were defeated and humiliated by him (Mahishasur). The Gods took refuge under Lord Brahma, who took them to Lord Shiva and Lord Vishnu. The solution was derived by an idea of creation of a woman who possess the ultimate power to fight and vanquish Mahishasur. At a single point, the divine energy of all the fires coalesced and became Shiva, in the form of a beautiful, magnificent young woman with ten hands. Her face was from the light of Shiva. Her ten arms were from Lord Vishnu. Her legs were from Lord Brahma. Her tresses were formed from the light of Yama, the God of death; the two breasts were formed from the light of Somanath, the Moon God; the waist from the light of Indra, the king of Gods; the legs and thighs from the light of Varun, the God of Seas; hips from the light of Bhoodev the God of Earth; the toes from the light of Surya- Sun God; fingers of the hand from the light of the Vasus the children of Goddess river Ganga; and nose from the light of Kuber, the keeper of wealth for the Gods. The teeth were formed from the light of Prajapati, the lord of creatures, the triad of her eyes was born from the light of Agni, the Fire God, the eyebrows from the two Sandhyas that is sunrise and sunset, the ears from the light of Vaayu, the God of Wind. Thus from the energy of these Gods, Goddess Durga was formed. The Gods then gave to her their divine gifts: Pinakadhrik gave her a Trishul. Krishna gave her Sudarshan Chakra. Varuna, the sea, gave her a Shankh and the God of Fire gave her a missile. From the Wind God Vayu, she received Bow and Arrows. The King of Gods, Indra, gave her a Vajra and also Bell as the symbolic representation of his white-skinned elephant Airavata. From the God of Death, Yama- Durga received a Iron Rod, and from the Ruler of Waters she was given a Noose. Durga received many other precious and mystical treasures- Gifts of Jewels, New Clothing, and a Garland of Immortal Lotuses. Heaven's Architect gave her a Bright Axe and Kawach. God of Mountains, Himalaya gave her Jewels and a magnificent Lion to ride into battle. Equipped with the fearsome weaponry of the Gods and dressed in golden armor and jewels she set off, seated gracefully upon that lion. His thunderous roars shook the entire Universe. The balance of the Oceans, Mountains, Earth – all attained a new change, as whole new chains of mountains rose, while older ranges crumbled, cracked, and gave way to dust, water from the Oceans rippling in waves through all the 3 Worlds. Mahishasura and his Demon Allies found their attention drawn from Heaven to Earth. Though confident of their power and control in Heaven, even the conquering Demon host could not help being awestruck. The Demons had little time to take a glance on the radiant visage of their new adversary, because she engaged them on the battlefield. First the army of Chikasura and then of Chamara- Mahishasura's chief commander came to confront the deity. They were destroyed in a great battle. At first, confident of his overwhelming power, Mahishasura was sure to defeat the Goddess, but seeing the setbacks being dealt his commander's troops on every side, it soon became obvious to Mahishasura that he would surely be cast out from Heaven. Onto the battlefield swarmed that most despised assemblage of Demons, wielding their unearthly collection of weapons. Leading this evil array in its mad and desperate charge were thousands of charioteers and cavalry of horses and elephants. Surrounded by chants of praise, the blowing of horns the beating of drums and songs of worship Goddess Durga roamed the battlefield on her mighty lion. From her divine breath her army was constantly replenished with new warriors, each able, brave and resolute. Mahish, the king of the demons and usurper of the throne of Heaven, was shocked and enraged by the disastrous events on the battlefield. He reverted to his own form, a buffalo, and charged about on the battlefield. He ran wildly at Durga's divine soldiers goring many, biting others and all the while thrashing with his long, whip-like tail. Durga's lion, angered by the presence of the demon-buffalo, attacked him. While Mahishasura was struggling with the lion, Durga threw her noose around his neck. To escape this trap, he discarded the buffalo disguise and assumed the form of a lion. Durga beheaded the lion, and the demon escaped in the form of a man. Without hesitation, Durga dispatched the man with a flight of sharp arrows. Yet again the demon escaped, and this time took the formidable shape of a huge elephant, which battered Durga's lion with a tusk. With her sword Durga hacked at the tusk until it too was broken. leg. She grasped his head in one hand, pierced him with her sharp spear held in another, and with yet another of her ten hands she wielded her bright sword, beheading him. At last he fell dead, and the scattered surviving remnants of his once invincible army fled in terror. The Gods returned to heaven, and along with the sages of the earth, they sang praises for Goddess Durga. 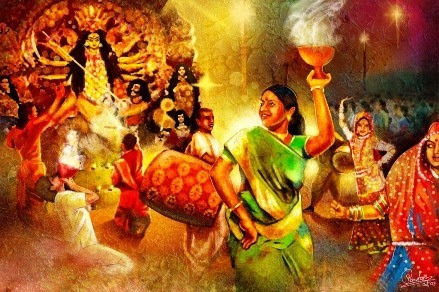 Henceforth, and to this day, the Goddess Durga is worshipped by all the Gods in heaven, and all human beings on earth. Mahishasura is there too--frozen in his moment of final defeat, impaled by Durga's spear and prostrate beneath her left foot.